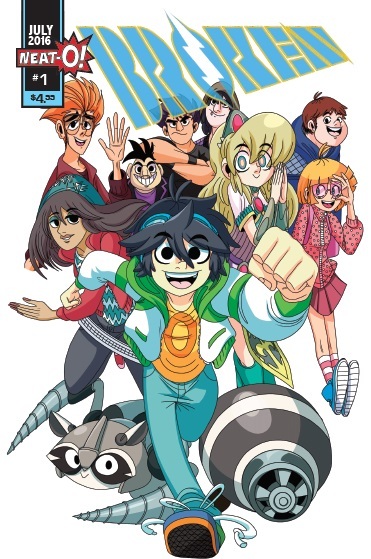 Inspired by his love of video games, American comics, and Japanese manga, Johnny Parker has created the 'Broken' comic as a love letter to his passions in an all-ages adventure that is fun and relatable. In a world where one of the most popular games is 'Cyber Scrap Battle,' a 3D fighting game whose downloadable characters learn to fight through its AI, it's up to the user to train them to get better making equal from the beginning. When bullies destroy his control icon holding all his stored game data, teenager Patrick Carter has to find a new one. He gets his hands on an older version of the game with a character who's been passed around for being a terrible fighter. It's up to Patrick to prove his point - that any character can be a winner with the right training. This is the general premise and it works perfectly to draw the reader in to not only see Patrick prove the bullies wrong but get redemption for the video game character known as Erin. There are some other mysterious shenanigans going on in the subplot that comic that will undoubtedly come to a head at some point. It's an engaging and fun beginning to 'Broken' that deserves a proper run. Jose Garcia's anime-inspired art is a joy to watch. It's colorful, well paced and laid out with larger than life panels. The video game play is captured in ways that replicate the characters' experience as being in the room via the 3D technology. Garcia's character designs are varied creating an inclusive and diverse cast of kids and adults that feel representative of the real world. Paola infuses the pages with wonderfully bright and eclectic colors clearly influenced by things like Steven Universe. 'Broken' is really a well-conceived, fun and fresh approach to all-ages books. It has broad appeal with its charming cast of characters and the message of practice makes perfect is universal. It also has a 'Rocky' vibe that will keep readers cheering and engaged. It's currently available on Kickstarter here --> BROKEN COMIC and if you love things like Smash Bros, Pokémon, and anime then this comic is a must-buy.